Refugees have fled from the US to Canada, because they know they can have a better future if they choose to live in Canada. As reported in our previous article about the spate of refugees braving the harsh winter weather to flee the U.S into Canada, seeking asylum due to fears of persecution under the current unfriendly immigration policies of the Trump administration. The situation has continued to escalate and is attributed to the Executive Order signed by the U.S president Donald Trump a few weeks ago. The Executive Order aimed to ban entry into the U.S of people from seven Muslim-majority countries, and the effect of this is that many immigrants and refugees seeking asylum in the United States are now looking to Canada as a safer country. On Monday the Canada Border Services Agency, or CBSA, said at a news conference that it had converted an unused basement into a refugee claimant processing center. 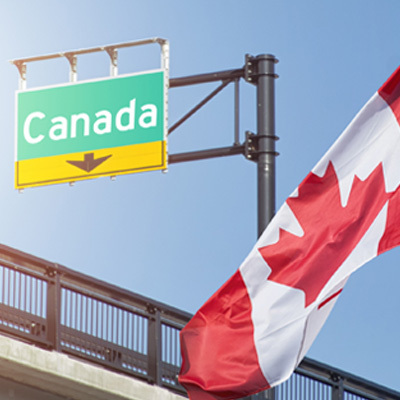 Both the border agency and the Royal Canadian Mounted Police are reassigning staff from other locations in the province, as needed, to accommodate the growing demand. In true Canadian spirit Montreal Canada’s second most populous city on Monday, voted to declare itself a “sanctuary city,” making it the fourth Canadian city to protect illegal immigrants and to provide services to them. In the executive order, president Trump barred all entry to the U.S for natives of seven Muslim-majority countries. It is a ban so wide in its reach that it prevents up to 500,000 green card holders from either leaving America or re-entering if they are abroad. These are people who had made America their permanent home. The Executive Order suspends the entire U.S refugee admission program for 120 days, even though it has some of the most rigorous vetting procedures in the world, taking 18 to 24 months and requiring interviews and background checks through multiple federal agencies. 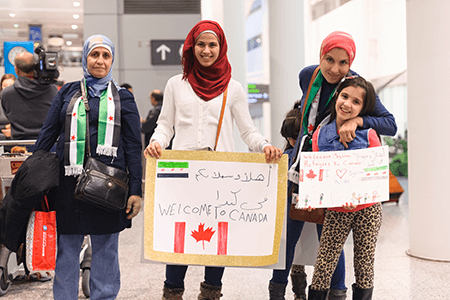 Suspends the Syrian refugee program indefinitely, the U.S accepted 12,486 refugees in 2016 in contrast by the end of 2016 Canada had received up to 40,000 Syrian refugees. Banned entry from seven Muslim-majority countries – Iran, Iraq, Libya, Somalia, Sudan, Syria, and Yemen, for 90 days following the signing of the order. The order also gave the Department of Home Land Security to ban more countries at any time. Prioritizing refugee claims on the basis of religious persecution, as long as the refugee claimant belongs to a religion that is a minority in their country of origin. This policy would allow the White House to prioritize Christians from the Middle East over Muslims. The United States also lowered the total number of refugees to be accepted from any country in 2017 to 50,000 from 110,000. “To those fleeing persecution, terror and war, Canadians will welcome you, regardless of your faith, diversity is our strength.” It was a tweet heard all around the world. This was Canadian Prime Minister Justin Trudeau’s response to Donald Trump’s loathsome Muslim ban that had sparked outrage around the world. While the Canada-U.S Safe Third Country Agreement allows Canada to turn back any asylum seekers crossing into Canada from the U.S illegally. This policy will now have to be re-evaluated as the United States can no longer be considered 'safe' for refugees under the current government as Canada continues to receive refugees fleeing America on a daily basis. Due to the political situation and the perceived lack of security of refugees in the U.S has meant for these immigrants Canada is their only option. The Trump presidency and its promised hard lines on immigration has increased those refugees fear of being sent back to their home countries. Most of them consider deportation as a death sentence, so instead, they are taking the risk of traveling through snow filled fields to Canada.